The figure Functions tree shows almost all nodes (functions, categories, filter expressions, logical expressions) which are available. It is possible to disable and to enable each node in the tree. A disabled node is not considered when analyzing logs. If you disable a node all nodes below this node are also disabled even though their check boxes stay ticked. Ascolog Insight assigns meaningful default names to nodes (e.g. New Color Rule or New Record Filter, etc.) when they are created. Use the mouse to drag a node to a different position in the Functions tree. The node will be added at the end. Right-click on a node you want to manipulate to open its context menu. Commands are only available when it makes sense to execute them, otherwise they are displayed in gray. Table Context menu of the Functions tree lists and describes the available commands. Insert Inserts a new node below the selected node. You can insert analyze functions, categories, filter expressions and logical operators. Parent Inserts a new node above the selected node. You can insert categories, logical operators and the filter expression RANGE. Edit... Opens the Filter Expression dialog where you can edit a filter expression. Rename You can specify a different name for the node. Collapse Filter expressions can be combined using logical operator nodes (AND, OR, NOT) but logical operators can also occur within filter expressions using the following symbols: &&, ||, ! This command transforms filter expression combined by logical operator nodes into a single filter expression with the same meaning. The single filter expression contains all original filter expressions and logical operators. Expand Expand does the opposite of the Collapse command. 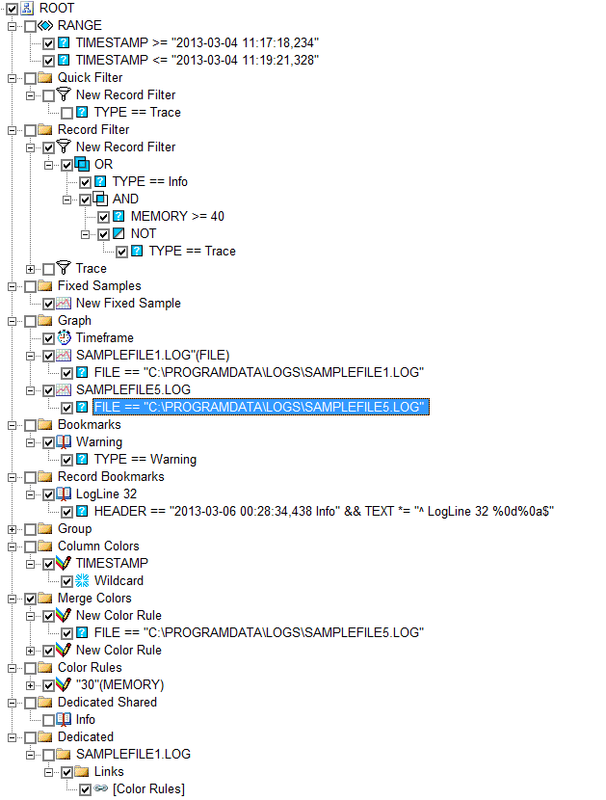 Ascolog Insight creates a sub-tree consisting of filter expressions and logical operators nodes which form the same Boolean expression as the original single filter expression. The most “smallest” filter expressions are used for the nodes Smallest means that only comparison operators but no &&, || or ! operators are used within a filter expression. Switch Changes an OR node to an AND node respectively an AND node to an OR node. Range Changes an AND node to a RANGE node. Delete Deletes a node and its sub-nodes. Cut Copies a node to the clipboard and deletes it from the Functions tree. Copy Copies a node to the clipboard. Select a node and right-click to open the context menu. Select Link. A link will be created and the link is available in the clipboard. Select the node where the newly created link should be located and right-click to open the context menu. Select Paste. A Link node will be created as a sub-node of the selected node. Paste Inserts a node from the clipboard as a sub-node of the currently selected node.